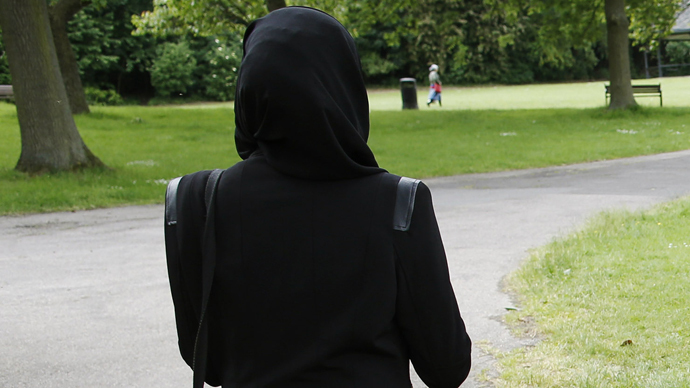 A British Muslim woman allegedly had her hijab ripped off in a racially motivated attack in London. Police say they have arrested two people in connection with the crime. The investigation is ongoing for the incident, which happened as a young Muslim woman was walking toward a private Islamic primary school in south London to collect her two children on Thursday. The woman says she was approached by a number of women, who began shouting abuse at her. She was asked by the women if she felt hot wearing a headscarf. The attackers then proceeded to pull her hijab off and started to beat her near the Al-Khair school in Croydon. "They pulled my headscarf off and started punching and kicking me,” the woman, who wished to remain anonymous, told the Evening Standard newspaper. “One was dragging my head down while the others were hitting me. They were being so racist and using derogatory terms." She said that she suffered whiplash and clumps of her hair were missing following the attack, which was only stopped when another parent came to her aid. A Metropolitan Police spokesman said: "We take any offense seriously. We have made two arrests in connection with our ongoing investigation." The two women arrested are aged 18 and 35. They have been released on bail and ordered to return to the police station at a later date. In May, the Muslim Council of Britain and the Church of England condemned a spike in hate crimes recorded by police in England and Wales since 2012. The majority of the hate crimes were committed against Muslims. Racially or religiously aggravated harassment crimes – such as verbal or written racist abuse – increased from a total of 15,249 in 2012 to 17,605 in 2014. The figures, obtained from 41 of 43 police forces approached through Freedom of Information (FoI) requests, show a total of more than 47,000 hate crimes recorded over the past three years. Muslims have been the main victims, say anti-racism campaigners, partly due to the rise of Islamic State (formerly ISIS/ISIL), the murder of Lee Rigby by Islamic extremists in 2013 and anti-immigration rhetoric by right-wing and mainstream political parties. Dr Shuja Shafi, secretary general of the Muslim Council of Britain, described the recent spike in harassment crimes as “disturbing” but “not unexpected” before stressing the “urgent need” to combat the growth of Islamophobia across England and Wales. “With racist bullying in schools attributed to Islamophobia on the rise according to ChildLine, job discrimination against Muslims commonplace and regular attacks against Muslims ... there is a serious concern that needs to be both acknowledged and tackled,” Shafi said.